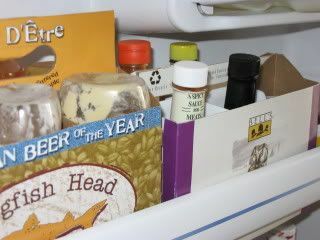 Our the bottles in our mustard and hot sauce collection flopped all over the shelf in the refrigerator door like drunken sailors. I pulled out a 6 back holder from the recycling bin and used it to organize my refrigerator. I used an empty butter tub to put all of all of those sample sizes of jellies and the occasional condiment packet in one place so we can actually find them to use them. Since then, I've used 6 pack holders to corral paints in my craft room, TV remote controls, and our Wii controllers. I also clipped the cardboard that holds the bottles in place in a couple of 6 pack caddies and turned them into cleaning caddies. That way they can corral a small bottle of cleaner and the bunch of cut up old towels and t-shirts left over from projects that I use as cleaning rags. 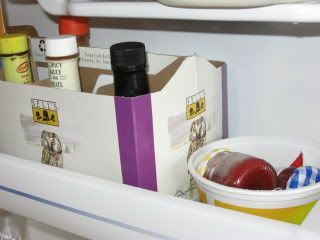 Since all of these 6 pack holder turned organizers live in cabinets or the fridge I haven't bothered to pretty them up by covering them with paper or fabric but you certainly could. If you don't have a craft beer hobby like my husband and I do, you can use cardboard coffee cup holders from a coffee shop. Great ideas. Simple, green and inexpensive. Great idea, I especially like the idea of using them for remotes and Wii controllers. Definitely going to do this. Also: I congratulate you on your fine taste in beer!